An increasing number of CEOs and other organizational leaders believe there is new opportunity in being able to run analytics processes against the rising tide of surrounding data. The term that describes this advance in new analytics-led opportunities is called "Big Data." 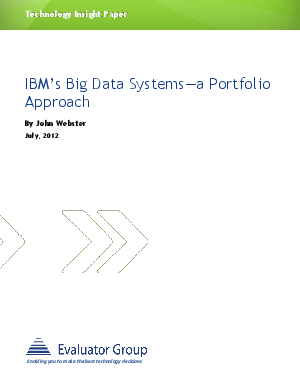 In this paper, the Evaluator Group discusses the Big Data environment, IBM Systems' ability to run analytics processes against the rising tide of data and the new opportunities that organizational leaders face.